Eva Bouzard-Hui was once again featured in the news for her outstanding artistic talent! 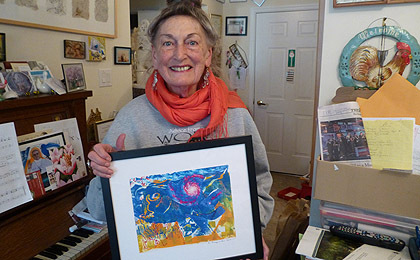 Eva Bouzard-Hui, a resident at Crane’s Mill, will be a featured artist in an exhibit at The Ethical Culture Society located in Maplewood. The show, which will feature Dr. Bouzard-Hui as an artist and art teach, having taught art in grades K -12 in the public school system in Caldwell, and in several colleges in the area. She also taught life drawing at Columbia Teachers College where she earned her doctorate in Art and College Teaching. Her most recent teaching experience was at the Crane’s Mill Day event this past September, where she mentored budding artists in the community. Above: Dr. Bouzard-Hui displays one of the works of art that will be included in the January exhibit.